Try our soothing, yet invigorating hair loss control shampoo and conditioner Lavender – Cypress “Rejuvenating” formula for hair growth. Rejuvenating botanical oils are combined synergistically to support a restorative self-care ritual for your hair and scalp. Our Hair Growth Formula is scientifically developed based on the physiology of human hair growth. Stops hair loss by stimulating hair follicles to stay in the growth phase. By our joining of lavender and cypress’ soothing and detoxifying botanical properties in one bottle, along with numerous additional botanical ingredients, you enjoy hair follicle cell protection, reduced hair thinning, healthy new hair growth and thicker hair strands. You can inhale their enticing aromas and feel them tingling your scalp as they are applied. Lavender essential oil introduces powerful antioxidants known for restoring moisture, replacing vital nutrients, and encouraging the detoxification of your hair follicles. Lavender is calming, with incredible anti-inflammatory properties to enhance the active/rest stages of your hair’s growth cycle. Invigorating cypress essential oil boosts cellular regeneration and extends the hair’s life cycle. Cypress wood is lauded as one of the strongest, most resilient woods in nature. Our hair loss products line uses essential oils – not chemicals – to reverse alopecia or hair loss. We tap into the healing genius of nature to cleanse your hair and scalp, while promoting new hair growth. Our one-of-a-kind anti-hair loss Lavender – Cypress “Rejuvenating” Formulation contains only natural, botanically derived ingredients so you can feel, and smell the difference. 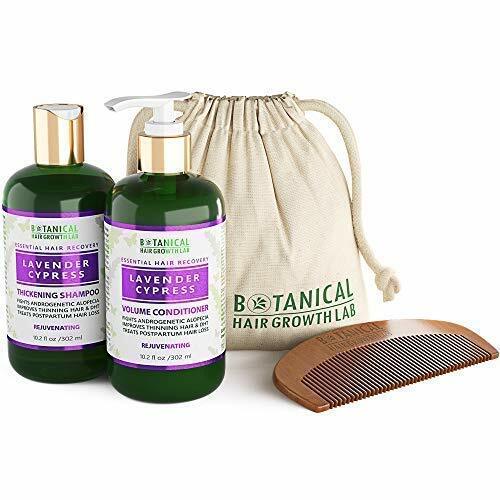 Try our soothing, yet invigorating Hair Growth Lavender – Cypress “Rejuvenating” Anti-Hair Loss Shampoo and Conditioner Set. Rejuvenating botanical oils are combined synergistically to support a restorative self-care ritual for your hair and scalp. The plant compounds in our hair growth products are based on ancient healing modalities which support healthy circulation, the balancing of hormones that affect hair growth, cellular detoxification, cellular regeneration, and abundant healing. By our joining of lavender and cypress’ soothing and detoxifying botanical properties in one bottle, along with numerous additional botanical ingredients, you enjoy hair follicle cell protection, reduced hair thinning, healthy new hair growth and thicker hair strands. It is also a form of aromatherapy used in multiple healing modalities to promote feelings of warmth, cleansing, re-energizing, and over-all healing. Try our best hair loss shampoo for men and women! Our SLS-FREE shampoos are inspired by ancient healing traditions which utilize herbal science to promote circulation, get rid of excess sebum (oil), and gently cleanse your hair’s roots and scalp. Instead of scalp-damaging sulphates (ammonium lauryl sulfate or sodium laureth sulfate (SLES), we use natural foaming agents from organic coconut. The vitamins and essential fatty acids found naturally in coconut oil nourish the scalp and help to remove sebum build-up from hair follicles. Our regrowth conditioners are in an entirely different class of organic hair care. They are PARABEN-FREE. For instance, we use soothing agents from organic rapeseed oil. The unsaturated fatty acids possess strong moisturizing properties, which coat the hair shaft better than other oils. Rapeseed is light with the ability to penetrate the scalp and shaft well. Numerous plant compounds and essential oils are combined to create our unique organic formulations that feel like a day at the spa. Our hair loss products formulas include number of essential oils to improve your scalp health with anti-fungal therapy and control dandruff accumulations on the scalp. Our anti-hair loss line is also a form of aromatherapy used in multiple healing modalities to promote feelings of warmth, cleansing, re-energizing, and over-all healing. Lavender essential oil introduces powerful antioxidants known for restoring moisture, replacing vital nutrients, and encouraging the detoxification of your hair follicles. Lavender is calming. It also encourages oxygen-rich, nutrient dense blood to circulate in the scalp. Invigorating cypress essential oil boosts cellular regeneration and extends the hair’s life cycle. Cypress wood is lauded as one of the strongest, most resilient woods in nature. It brings this same property to your hair by extending its growth cycle, calming hair-loss promoting hormones, and halting hormone-induced hair thinning. Our Anti-Hair Loss Conditioner Lavender – Cypress hair growth formula is also a form of aromatherapy used in multiple healing modalities to promote feelings of rejuvenation, soothing, calm, balance, and relaxation. Our essential conditioning hair loss mask uses essential oils – not chemicals – to reverse alopecia or hair loss. This concept of healing in our hair loss prevention conditioner is based on Ayurveda, Chinese and Traditional European Medicine . These are healing practices that use “pure substances” to bring the body back into balance. Our essential conditioning hair loss mask uses essential oils – not chemicals – to reverse alopecia or hair loss. This concept of healing in our hair loss prevention conditioner is based on Ayurveda, Chinese and Traditional European Medicine . Our conditioners utilize this ancient herbal science to promote circulation, get rid of excess sebum (oil), and gently smooth hair roots. Our conditioners also smell heavenly, without adding toxins into your blood stream. We don’t add artificial fragrance, because the healing plant compounds we use are their own natural aromatherapy powerhouse. 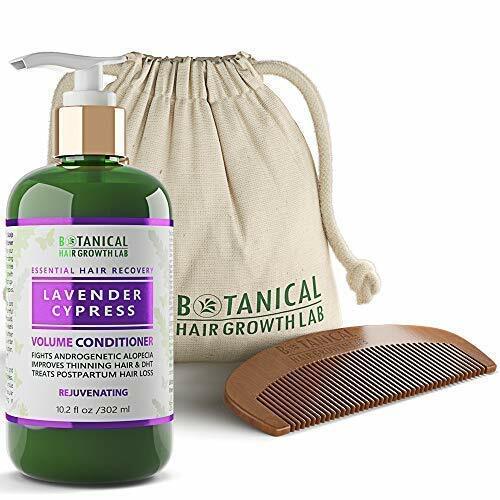 Try our Anti-Hair Loss / Hair Growth Botanical Conditioner Lavender -Cypress “Revitalizing” hair growth formula to soothe your hair strands, prevent hair breakage, and tame fly-aways while adding shine and body. We offer volumizing, conditioning formulations which not only add luster and beauty to your hair, but help you grow it! Our conditioners work with our pre-shampoo treatments and shampoos to infuse life, moisture, and nutrients into your hair and scalp – naturally. Use them together for a nurturing self-care ritual. Gentle massage of the scalp when conditioning is also highly revered in anti-hair loss therapies. Ideal gift idea – hair loss conditioner for men! Look for our hair loss cayenne shampoo and conditioner value set to save more. 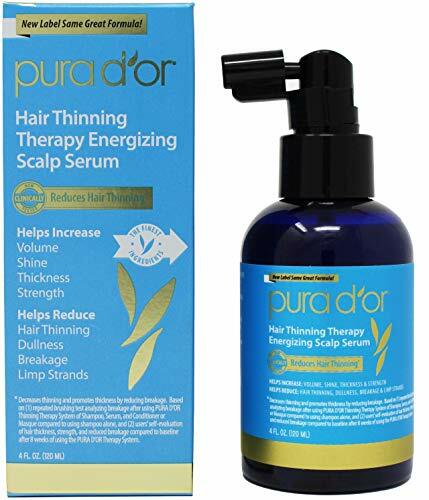 PURA D’OR Hair Thinning Therapy Energizing Scalp Serum is an intense treatment that nourishes the scalp and strengthens hair. Exclusive formula delivers 15 key active ingredients specifically developed to maximize the results of the Hair Thinning Therapy system. Caffeine, Catalase, and Cayenne invigorate the scalp, while Apple Fruit Stem Cell and Pea Protein Extract increase hydration and help protect strands from future damage. Free from harsh chemicals, environmentally responsible, hypo-allergenic, vegan and cruelty free. CLINICALLY PROVEN POWER. Clinically tested formula has been proven to have many great benefits including reduce hair thinning. PREVENT HAIR THINNING NATURALLY. Stimulating blend of 15 Key Active Ingredients including Niacin, Biotin, Argan Oil, antioxidants and other natural ingredients that detoxify the scalp and encourage healthy hair, strength and resiliency. GET TO THE ROOT OF THE PROBLEM. It all starts with a healthy scalp. This invigorating blend of extracts and essential nutrients fortifies and energizes hair from roots to tips, helping reduce hair thinning. GENTLE YET EFFECTIVE. Ultra-nourishing blend of premium oils & antioxidants specially formulated to effectively treat thinning, damaged, and/or color-treated hair. Gentle enough for daily use. SCIENCE + NATURE. All PURA D’OR formulas combine science and nature to deliver transformative hair therapy. No SLS (Sulfates). No Parabens. No Harmful Chemicals. Gluten Free. Hypo-Allergenic. Cruelty-Free. Manufactured in the USA. Color Safe.